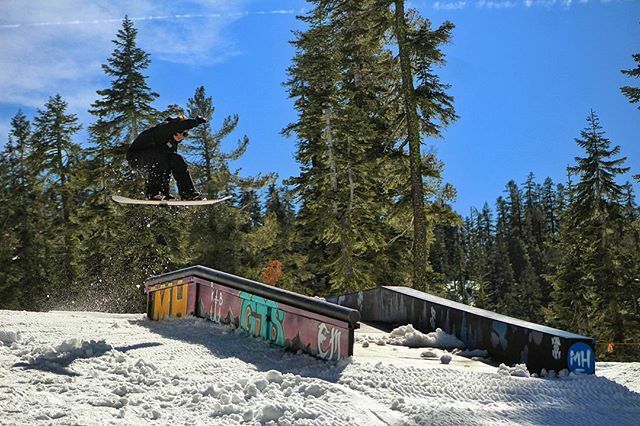 @kegz__ captured @alex_wetherhold putting in some test runs on the Sierra Fam memorial feature on a prime spring day. One of a kind art created by our very own @harborblueartcompany! This season El Niño delivered plenty of leg-shaking pow days, leaving your homies on the East Coast to curse your name. Hopefully their jealousy subsides now that spring has arrived, bringing the sunshine and good vibes along with it! 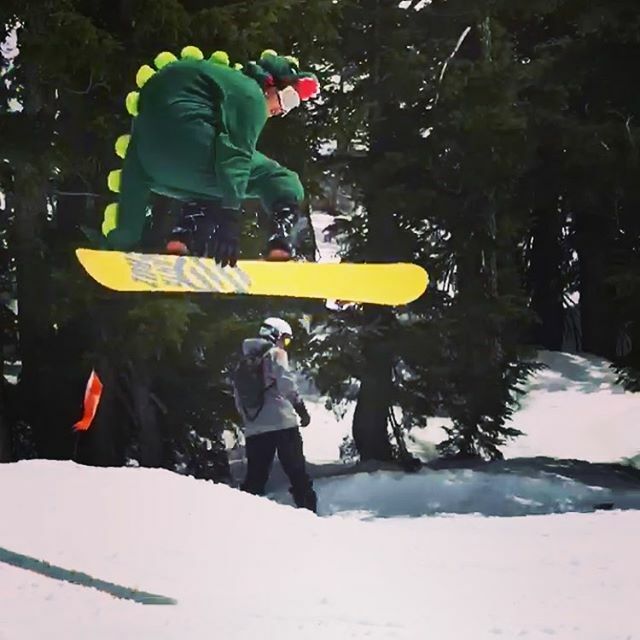 This March we have had incredible conditions after receiving 100 INCHES of snow, and we’ve still got plenty of spring season shenanigans to look forward to during April! While our pow days are coming to an end soon(ish), spring brings a whole different set of conditions that renew our love of the sport all over again. Surfing fresh pow is one of the best feelings in the world, however it can often be tiring, cold, and demanding on stormy days. Now it’s all about pulling out that Hawaiian shirt and working on a goggle tan so deep your crew will never question your dedication to the shred. Trade in those heavy Gore-Tex jackets for a steezy spring hoody (or dinosaur costume) and get ready to drink plenty of ice cold cervezas in the warm sunshine, amigos! @daog_guod shows us spring shredding attire at its finest! For those who are new to spring riding, it can be one of the best time of years to work on honing your skills. The fresh cords we lay down every day are perfect for learning how to butter, ride switch, or jib those side hits you’ve been eyeballing all winter. Another great part about spring riding is catching up on that beauty rest, boo! No need to rush to the mountain to shred down snow icier than that chick that rejected you on Tinder last week (we know that feel, bro). Think of spring riding as courting a special someone: you never jump right in for the kiss, you have to warm up to it first…or maybe you don’t, we don’t know your life! Anyways, the point is that you want to let the sun warm things up a bit before you hit the slopes, making the best time to shred those spring cords mid-morning. The sickest part about the mid-morning/early afternoon shred (besides the extra shut-eye) is that the bar is already open when you get here! Now we’re talking about getting warmed up in a whole different way, heyooo! Sierra is full of sweet spots for you + your crew to sip some cold ones on your ride break, including Solstice Plaza, with plenty of Adirondack chairs to chill in and multiple outdoor bars! Head up to the 360 Smokehouse deck for amazing views of that one lake that’s pretty cool, and then shred down to West Bowl to fiesta at the cantina and nom on some delicious tacos. 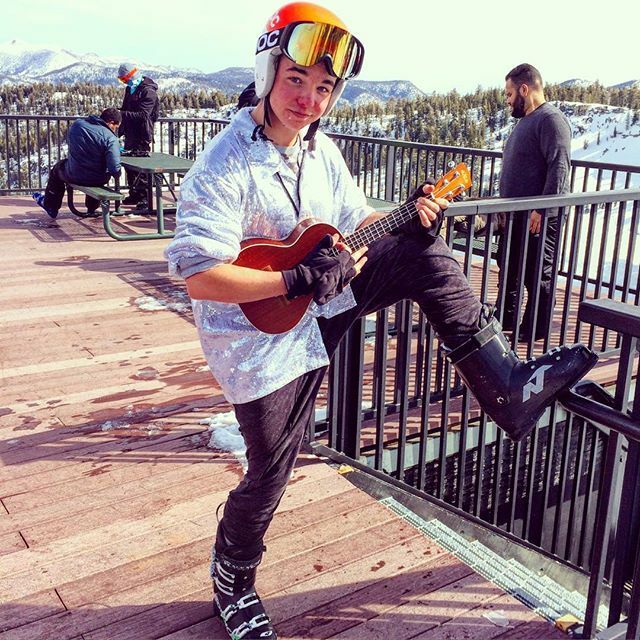 @sailor_g00n captured a Sierra kook in his natural habitat, serenading all the snow bunnies in the sunshine on the 360 Smokehouse Deck...try to contain yourselves, ladies! Bumming hard because you don’t have a pass and your homies cut you off from their employee vouchers? Bro, we got you. Buy a 2016/2017 Sierra Unlimited Season Pass today for the killer price of only $409, and ride the rest of this season FO’ FREE! That’s right, you can set yourself up for next season and be a part of all of Sierra’s spring shenanigans at the same time. Quit procrastinating already and treat yo’ self by swooping up a pass for the 2016/2017 season (and the rest of this one) here !